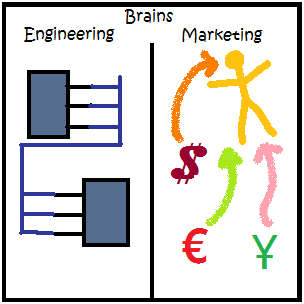 Once you've worked in as many software startups as I have, then you'll know there can be a Dilbertesque relationship between engineering and sales/marketing. If you use a microscope to examine the brain of an engineer, and the brain of a marketing person, then you'll find obvious biological differences - the brains are wired differently. The two brain types tend to blurt out dissimilar and conflicting ideas when sitting in front of potential customers, and thus we have plenty of stories to laugh about after the pain subsides. When you return to the office from a "sales" meeting, all of your colleagues want to know "how it went". Since we don't have an empirical measure for these things, it takes a lot of explaining to describe "how it went". Ship captains faced a similar problem describing wind intensity until Sir Francis Beaufort devised the Beaufort Scale in 1805. Let's say you are a captain returning to the pub after a rough day at sea. You meet another captain, who wants to know what the conditions are like. You could say, "There were moderately high waves with breaking crests forming spindrift – and streaks of foam, too." Alternatively, you could say, "Today was a total 8 on the Beaufort scale." The latter answer is shorter and helps you reach the pub in less time. I've devised the "Sales Force" scale in the interest of saving time. Sales Force measures the intensity of the reality distortion field in a sales / engineering / customer meeting. Conditions: Sales presented all the material prepared by engineering without alteration. Conditions: Sales presented some technical inaccuracies that nobody else noticed. For instance, "our database is written entirely in Microsoft's awesome C# language". Conditions: Sales made some statements you wouldn't agree with. For instance: "our application is totally using AJAX for an awesome user experience", when in fact only four web pages in 100 use AJAX. Conditions: Sales is making some bold claims for scenarios you've never tested. For instance: "our software can scale to 10 million users without breaking a sweat". Conditions: The customer just asked for a feature of such magnitude that only quantum computers cooled by liquid nitrogen could do the job. Sales replied: "yes, we have that in the plans for next quarter". Conditions: Sales described some feature of the software you've never heard about. Perhaps this was something they dreamed, but you know they'll expect you to build it. Quickly. Conditions: Sales presented screen shots of a "shipping application" where the screen shots were actually UI sketches built in Photoshop by a tattooed designer named Pablo who never came back to work after last year's Burning Man festival. Next time someone asks how the meeting went, you can just say, "Dude, it was a total Sales Force Level 7 meeting - I'm updating my resume". You'll get to the job boards even faster. I like it :) - perhaps this is the sort of thing they should prepare developers for in CS courses. I can see this being stuck on a wall within view of sales people. Only someone who has lived this could come up with something so compellingly true and right! This is funny everytime i read it. My friends and I reference this often.